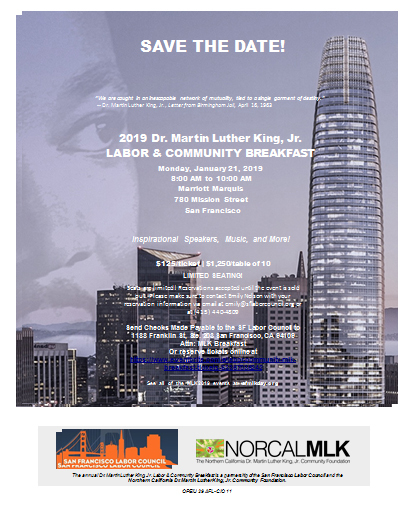 Join us for our annual 2019 Martin Luther King, Jr. Labor & Community Breakfast on Monday, January 21st at 8:00 AM. Seats are limited! Reservations accepted until the event is sold out. Please make sure to contact Emily Nelson with your reservation information via email at emily@sflaborcouncil.org or at (415) 440-4809. Register online at the MLK Breakfast Eventbrite page. Following the breakfast, enjoy the rest of the MLK Day celebration events at Yerba Buena Gardens. For more info on the day’s events, go to sfmlkday.org/events.html or @norcalmlk on Twitter.